This summer the St Vincent de Paul Society Canberra/Goulburn is ready for the surge of donations that usually comes after Christmas as households start to clear out items and get ready for the New Year. Each year after Christmas Vinnies is the grateful recipient of an overwhelming amount of donations that helps stock the shops throughout the year. “We often get calls from people who are unsure about what we’re able to take, so we decided to get on the front foot this year and develop a fact sheet on how to be an ace op shop donor,” explains Paul Quinn, Vinnies Shops Area Manager ACT. The fact sheet released by the Society this week outlines items that the Vinnies shops are happy to receive while also highlighting what can’t be taken. “Unfortunately due to some laws and restrictions there are some items we can’t accept like baby car seats, prams and cots, mattresses and electrical items,” shares Mr Quinn. Vinnies gets such a high volume of donations that the charity bins quickly fill up, with people leaving donations outside the bins at the risk of the elements. “When donations are left outside of the bins they get damaged from the weather, bugs and animals get into the bags, which unfortunately makes them unusable,” expresses Mr Quinn. 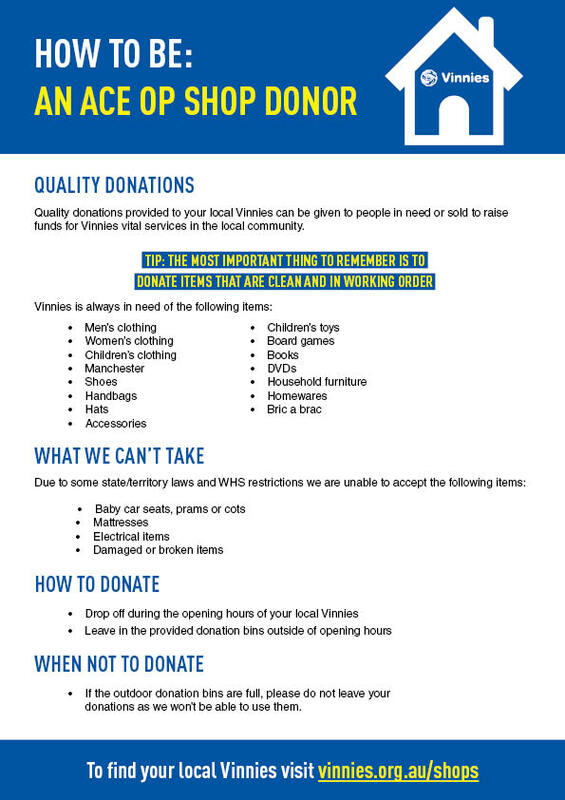 Vinnies Canberra/Goulburn are asking people not to leave donations outside of the charity bins if they are full, rather come back during opening hours when volunteers are able to take the donations inside. “People donate with the best intention of their goods going to someone in need or raising funds for our services. The best way to ensure that that’s what happens is to drop off your donations when our shops are open so we can take them inside straight away,” says Mr Quinn.